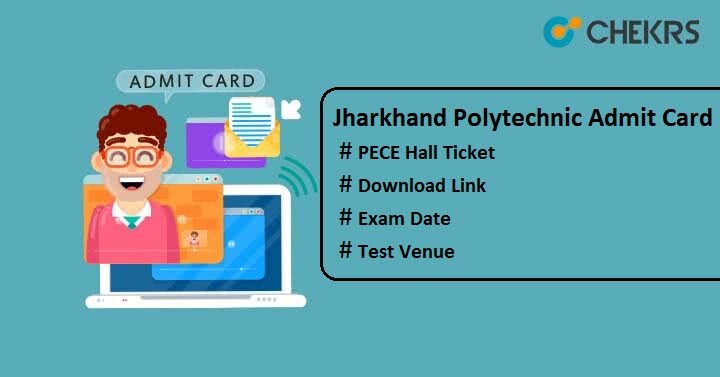 Jharkhand Polytechnic Admit Card 2019: Jharkhand Combined Entrance Competitive Examination Board (JCECEB) will conduct Polytechnic Entrance Competitive Examination (PECE-2019) in May month. For this, you will have to download the Jharkhand Polytechnic Hall Ticket from the official website. No hard copy of Jharkhand PECE Hall Ticket will be sent to any candidates via post. So must download it through online mode. Here we have discussed how to Download the admit card, admit card release date, exam dates etc. The examination controller of JCECEB will issue the Jharkhand PECE Hall Ticket on its official site 1 or 2 week before the exam date. Take a look on the given exam date to be on time for all exam events. Visit the official website of JCECEB i.e. jceceb.jharkhand.gov.in. Go to the “Admit Card” option available on the top of the home page. Select Examination and then enter “Form no” or “Candidate’s Name”. Click on the “Search” button. A list of name will be displayed on the screen. Search for your name by matching your father’s name & application no and click on that link. The “PECE-2019 Admit Card” will be appeared on the screen. Save it. Take the printout of it for future use. Candidates are advised to download the Jharkhand PECE Admit Card before the examination as it will only be active for specific time period. Check the all details mentioned on the admit card, if any discrepancy found contact to the JCECEB officials immediately by sending mail. Must reach at the examination center 30 minutes before the exam timing. No one will be allowed to enter the exam center so must bring the downloaded admit card while appearing for the examination. We hope it is helpful to you all. Even if you have query, you can ask in the comment section below. To get latest update, must visit this site regularly. Good Luck!! !